Estimates of extreme poverty are never exact, because the settings where extreme poverty exists don’t allow for exact measures. The poorest people are mostly subsistence farmers with insufficient harvests or destitute slum dwellers, with unpredictable and constantly changing living conditions and few documented monetary transactions. Even staff at PovcalNet told us some years ago that the uncertainty of their estimates is probably in the range of half a billion people. But the trend is still reliable, as the sources of uncertainty are similar over time. This is problematic today, but the problem is even larger for historical estimates. The historical levels of extreme poverty can’t be known exactly. But as long as something is estimated in a consistent way over time, and the same sources of errors are present to roughly the same extent, the declining trend is quite reliable, even if the level of the line at every given point in history is uncertain. Most economic transactions were not documented back then, and adjusting for changes in prices, currencies, food, employment, and technology is very difficult. It urges for careful conclusions when using these data. The data after 1980 comes from PovcalNet and is described in the note to Fact question 3. The official World Bank estimate of extreme poverty in 2013 is 10.7 percent which Gapminder has extended to 2017, by assuming income distributions being constant and IMF GDP per capita forecasts are applicable on household incomes from PovcalNet. But even if the exact levels are uncertain, the trend direction is not uncertain, because the method for estimating has not changed, and thus the sources of error are probably constant over time. We can trust that the level has fallen to at least half, if not one-third. The historic estimates before 1980 are based on two sources. The first historic source: Bourguignon and Morrisson (2002) estimates that in 1820, the share of people living below $2 per day (in constant 1985 PPP dollars) was 94.4 percent, and the share of people below $1 per day was 83.9 percent. To express this in 2011 PPP dollar prices is not trivial. 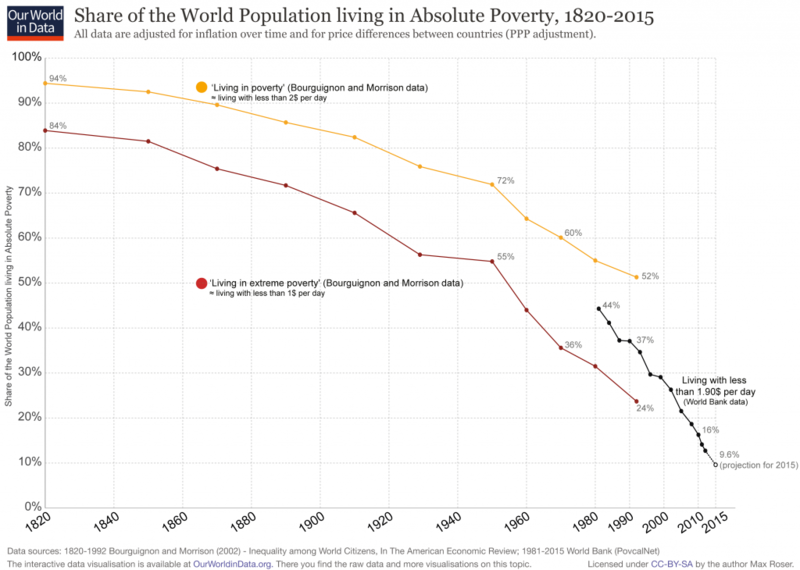 The two alternative rates from Bourguignon and Morrisson, Max Roser at OurWorldInData use the higher estimate when showing a single line for the global trend of extreme poverty rate. We have decided to go for a lower estimate, because of the second source. The second historic source: van Zanden indicates a lower rate. The paper World Income Inequality 1820-2000 uses historic GDP per capita from Maddison to estimate the income levels people lived on. For the distribution of incomes within countries they use historic records of the differences in heights of people (such as military data archives). Insufficient food intake during childhood stops growth and leads to a shorter adult person. By estimating the childhood stunting, they can guess the share of people missing food, that is, living in extreme poverty. Based on those estimations, they assess that 73 percent of people lived below $2 per day, and 39 percent below $1 per day (in constant 1990 PPP dollars). They couldn’t, however, construct height and GDP data for all countries. Roughly 25% of humanity are missing from this estimate. The share missing presumably amount to mostly the poorest who didn’t even have organized military archives. As a result, we can add them to the extremely poor, estimate that 82 percent of humanity lived in extreme poverty in 1820. We then pull this number back 20 years and assume that even more people were poor in 1800. We land on 85 percent on Level 1 at the start of the trend in 1800. The term “extreme poverty” has a set technical meaning: it means you have a daily income of less than $1.9 per day, as explained in the note to Fact question 3. The term “poverty” in many countries on Level 4 is a relative term, and the “poverty line” may refer to the threshold for eligibility of social welfare, or the official statistical measure of poverty in that country. In Scandinavia, the official poverty lines are 20 times higher than the poverty lines in the poorest countries, as in Malawi for instance, even after adjusting for the large differences in purchasing power; see World Bank. The latest US census estimates that 13 percent of the population live below the US poverty line, putting it at approximately $20 per day. In Sweden, the official numbers of “poor” is defined relative to the median income in the country, by counting all individuals with incomes less than 60 percent of the median income. The social and economic challenges of being among the poorest in a rich country should not be neglected. But it is not the same thing as being in extreme poverty. In extreme poverty, you can’t even afford a daily meal of staple grain porridge. You can’t get poorer without dying. See World Bank. See gapm.io/tepov. This is a paper from the World Bank describing the challenges of estimating consumption and income in extremely poor settings, available for download via this link. We’ll soon update this page with a detailed description of how we made the Gapminder estimate of a long historic trend for extreme poverty rate.